In order to really do justice to the writing of Trinity, I knew I had to return to Russia to deepen some of the things I’d experienced that first time, and enrich the sensory texture of the novel, and the series in general, especially as I would be writing some very important scenes in Moscow, which I wanted to know a good deal better than over the two and a half days we’d spent there in 2010. We didn’t want to stay in hotels or go on any organized tours either, this time, but instead wanted to experience daily life in the city, on our own. In order to do that I knew I needed to learn at least basic Russian. Used to slipping from English to French with fluent ease, I had found it frustrating to be stuck in the role of helpless tin-ear tourist the first time. So before we went the second time in August 2012, I enrolled in an excellent online course called Russian Accelerator, which, with an imaginatively devised combination of video and audio focussed on natural learning plus individual tutor attention, promises to make you fluent in basic conversation in just a few months, as well as to read Cyrillic script—a promise that was kept! And thus it was that a month after I finished my last Russian Accelerator lesson, we were crawling in heavy Moscow traffic, heading for one of the city’s most central thoroughfares, Tverskaya Ulitsa, or Tverskaya Street, and the apartment we’d rented for two weeks, only a few blocks’ walk away from Red Square and the Kremlin. Moscow is a great world city but it is also its own world. European but not Western; beautiful and ugly; built for giants yet surprising you with glimpses of cozy neighborhoods on a very human scale. Once the feared seat of the ‘Evil Empire’, it is now the brash symbol of Russian capitalism, buzzing with pushy energy yet also at times surprisingly relaxed. And of course Moscow is most certainly not the be-all and end-all of Russia. But like all great capital cities, it is also a kind of physical microcosm of the nation, of its history, its culture, its people. The shaggy parks mimic the forest; the river winds its way through the city’s heart, like waterways do throughout the land; Red Square, in its exhilerating yet overwhelming spaciousness is a kind of miniature of the sweeping vastness of the Russian landscape; the faces in the street are molded from features that have come from every corner of this enormous country. I loved being there. The city is exhausting and noisy, the blocks long, orientation not easy, and the distance between Metro stations are more than twice than what they are in Paris, for example. And there were small hiccups with the apartment–a wobbly kitchen table, a casual chaos of crockery, a steep learning curve to understand the water system, for example. And one day, on us being silly and absent-minded enough to leave the front door unlocked, there was a surprise visit from a sneak thief(much to the outrage of the landlord, who declared that the thief could not have been Russian!) But none of it mattered. Our two weeks in the Russian capital were intensely exciting, with every day an adventure, discovering more and more of the city as we trekked on foot and by metro and occasionally in a Russian friend’s car, going from central sites to those much more far-flung and even beyond the city limits. My writing journal, compiled in the tranquil haven of the apartment after long days spent pounding the pavements, filled with impressions and vignettes and characters gleaned from the streets, the Metro, the cafes, the parks. These ranged from the strikingly handsome young man glimpsed one day on the Metro, whose distinctive face was to become the model for that of Trinity’s hero, Alexey, to a little park full of fantastical statues, where Alexey and the novel’s heroine Helen wandered; from the casual mayhem of Muscovite roads to the sweaty efficiency of the Metro, from the candle-lit beauty of glimpsed Orthodox services to the extraordinary displays in the Cosmonaut Museum, including the tiny, tinny capsule in which Yuri Gagarin went into space. In contrast to the cramped vulnerability of the capsule, there is an enormous metal statue of Gagarin on Leninsky Prospekt. The statue is over 12 metres, or 40 foot high, and stands on a plinth over 27 metres, or 90 foot high. Unveiled only in 1980, this enormous object, reaching far into the sky, transforms the diminuitive astronaut into a giant, lantern-jawed, muscle-bound superhero. Massive statues were very much a feature of Soviet times but the urge for them isn’t gone, with a controversial massive sculpture commemorating Peter the Great, put up as recently as 1997. In pre-Revolution days, Red Square once housed a massive fair, and these days, the fair has come back, at least to the space behind it, dominated by the red bulk of the Historical Museum, and yet another massive statue, that of war hero marshal Zhukov. Here are hot-dog stands, touts selling their wares–watercolours, matrioshka dolls, keyrings, books–to Western and Chinese and provincial Russian tourists, animal handlers with monkeys in caps and eagles on perches, impersonators of historical and political figures–Lenin, Stalin, Peter the Great, even Yeltsin and Putin, but no Gorbachev- and polemicists shouting political tracts to the wind, listened to by nobody. On weekends in the fine months, there are rock concerts and market stalls as well. Foreigners, particularly anglophones, often say Russians are cold and impassive in public. I didn’t find it so. Russians in public are no more reticent than say, French people in similar situations. People don’t smile at strangers or say ‘have a good day’ in shops; in fact they’d think that was bizarrely hypocritical. They keep their distance and in shops make no attempt to smarm up to a customer–reminding me of Paris, except without the superior manner adopted by many Parisian shop staff! (In Moscow, unlike Paris, however, even the touts seem quite diffident and are easily brushed off. ) In cafeterias and restaurants, staff are brisk, and don’t hover. Occasionally, we came across the stereotypical ‘porte de prison‘ style, as the French saying has it, (literally ‘prison door’ or, metaphorically, closed, unpleasant manner). But that was rare. Much more often we found people to be helpful if requested–for instance, willing to go out of their way in giving us directions on the street. It helped a lot, though, that I could at least speak some Russian. Russians don’t expect foreigners to know their language but are surprised and delighted when you try–several times I was praised for my humble little phrases with a beaming ‘Maladyets! ‘ –well done! Shopping for groceries, we marvelled at the extraordinary variety of fish on display in supermarkets: fresh and smoked and salted fish and eels, glistening glass dishes and pots filled with red and black caviar, ready-prepared fish soup in little tureens, accompanying sauces and salads in appetizing rows. In the neat Danilovsky markets, black-haired Caucasian vendors propose piles of gleaming fresh and dried fruit, brawny dairy men display tall jars of luscious ‘smetana’ or sour cream and bottles of kefir, a traditional soured milk drink, while strings of sausages adorn the butcher’s shelves and women in flowery scarves sell the produce of the woods: mushrooms and berries of all sorts. As in Paris, little street markets offer humbler versions of the same cornucopia, and we bought lots of our fresh fruit and vegetables from them. When we didn’t feel like cooking, there were lots of very reasonably-priced eat-out options to choose from, from market snacks–fresh piroshki(savoury pies), shashlik (grilled meat on sticks, similar to kebabs)Central Asian fried pastries or Russian-style hot dogs—to great little restaurants serving Russian or Georgian food, to cheap and cheerful cafeterias such as the Mu-Mu chain, where you choose from a vast selection of pre-cooked dishes, salads and cakes. It’s not only excellent for good fast food at a good price, but a relaxed atmosphere and great people-watching, as people from all walks of life duck in there for a quick meal. Everything jostles everything in Moscow–monuments to both old and modern State megalomania next to shabby flats, smart shops selling expensive lingerie and shoes cheek by jowl with humble little stores not much more than holes in the wall, where you can purchase items such as drinks, milk, cigarettes, pastries, stockings. Lots of little flower stalls–Russians adore flowers and spend a lot on them–dot the city, along with icecream carts–another Russian love–and these simple places are patronized by all classes of society. Despite the well- documented problem of alcoholism in Russia, we saw no public drunkenness but some beggars on the streets, sometimes in striking juxtapositions –such as the soft voiced, shamefaced old lady in a flowery scarf, humbly murmuring a plea in the shadow of a smart hotel where the latest-model cars pull up, disgorging arrogantly gilded youth; the handsome young man with no legs, either war veteran or accident victim, staring past shoppers in the bustling Arbat; and two black-clad nuns in black habits singing for their supper in front of the baroque splendours of the Tretiakov museum.. But there is nothing like the amount of beggars you see on the streets of Paris, and these beggars have nothing like their brash panache–like the touts, they seem embarassed to be there. Another kind of person you don’t often see on Moscow streets are cops–they keep a fairly low profile, except when there are demonstrations or other mass gatherings, where you might see both ordinary police and OMON police. One time, in the Alexandrovsky Gardens, we catch a glimpse of OMON officers questioning a small group of shaven-headed young men in leather jackets, though in this case, they just let them go. Another sighting of police, the ordinary ‘miltisiya‘ (the Soviet term is still used by most people, even though recently the name has been officially changed to ‘politsiya‘ ) outside the metro station near the Izmailovo markets shows them stopping people of ‘Central Asian appearance’, checking work permits and ID papers. Who knows what it is we are actually witnessing–a real check up of illegal workers, harassment of foreigners, or a shakedown? Any of those is possible, our friends tell us. The police have a bad reputation in Russia, often for good reason, and the good ones either go under or become bitter. And so, from these few small glimpses of the ‘guardians of law and order’, my character Maxim Serebrov, disillusioned but tenacious Moscow policeman, began to take shape. Much blood has been spilled in the city over the centuries, for from Tsarist times to now but especially in the Stalinist period, Moscow has been part of the dark aspect of Russian history. And as so often happens here, historical strands get mixed and paradox abounds. The beautiful multicolored domes of the cathedral of St Basil the Blessed commemorate the life of a humble little beggar who didn’t even achieve sainthood yet whose lovely shrine is the universal symbol of Moscow. The story goes that Ivan the Terrible, who commissioned the cathedral, ordered that its architect’s eyes be put out, not because he was dissatisfied with the work, but rather the opposite–because he thought it was so magnificent it had to stay unique, and the architect should not create any more such works! 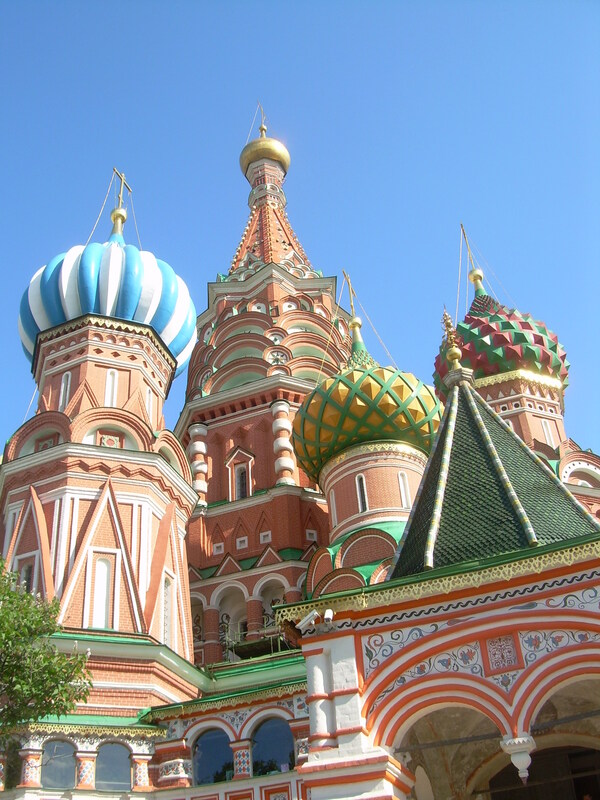 It’s an apocryphal story–there is absolutely no real evidence that such a thing happened–but as an allegory both of the cathedral’s unique beauty and the Russian love of extremes, it works! By the river is a building known as ‘The House on the Embankment’. Built on the site where once stood the headquarters of the Moscow streltsy( guardsmen)regiments, bloodily destroyed by Tsar Peter the Great after they rebelled, the House was created in Stalinist times as a luxurious apartment block for high-ranking Communist Party officials and other Stalinist nobility. But the place was a gilded mouse-trap, with each apartment bugged, and at least one-third of the building’s occupants falling victim to Stalin’s purges. These days, it’s one of the top addresses in Moscow, and flats there are very dear! Stalin’s influence is apparent not only in the dark stories of the past but also in the city’s architecture: for instance, the seven skyscrapers known variously as ‘Stalin’s candles’ or ‘the Seven Sisters’ mark the skyline at various parts of the city. Built under Stalin’s orders, and influenced by his love of 1930’s American skyscrapers such as the Chrysler Building and the Empire State building, but with a distinctive ‘Russian gingerbread’ touch, they are surprisingly attractive. A couple of times on our walks, we pass the Lubyanka, seat of the intelligence services since Bolshevik times–first the Cheka, then the NKVD, then the KGB, and now part of the FSB. Once the headquarters of a 19th century insurance company, the yellowy-brown stone building does not give much of a hint of its dark past or of its secretive present. But in yet another symbol of that paradox that is Moscow, right next to the Lubyanka is a somewhat dilapidated early nineteenth-century mansion in the Italian-influenced baroque style that is more common in St Petersburg than here. It was once the home of the Rostopchin family, whose head, Count Fyodor, was once the Governor of Moscow at the time of Napoleon’s invasion in 1812, and who gave the infamous order to burn Moscow. His daughter Sofia emigrated to France, married there and later became the most famous of all French children’s writers, the Countess de Ségur. And the Rostopchin home, much later, became the Moscow pied-à-terre for visiting KGB dignitaries. And of course, that was another thing I learned, which also went into the texture of my novel. And that is that our Cold War thrillers and films may have portrayed the KGB as fearsome enemies, but in Russia, the picture of them is very different, especially in the case of the external spy agency (rather than the feared internal secret police) which have featured in popular Russian TV series and films, both past and present, as brave and cunning defenders of the motherland It was one of those series, Shield and Sword, that reputedly was one of the inspirations for a young Vladimir Putin to join the spy agency. Today, the FSB, successor to the KGB, hands out its own ‘Oscars’ type awards, complete with glass statuette, to film-makers and TV producers whose work ‘most accurately’ (!) reflects the world of the Russian spies.